SDA Bocconi is the leading School of Management in Italy and also stands among the top-ranked European Institutions. Founded in 1971, with its over 40-year experience, SDA Bocconi School of Management is a pioneer in business education in Italy: its hallmark is innovation and far-reaching modelling that manifest themselves through a wide array of executive courses and master programs. The Schools mission is to educate men and women ready to act anywhere in the world, using their knowledge and imagination. The SDA Bocconi School of Management faculty generates distinctive knowledge of the highest quality through education and research. For over thirty years, the School's faculty has worked alongside businesses and institutions to contribute to the development of Italy and the internationalization of its economy through its many areas of competency. In 1998, SDA Bocconi was the first institution in Italy to obtain EQUIS (European Quality Improvement System) accreditation. SDA Bocconi operates on all the strategic fronts of education and first and foremost our MBA programmes. SDA Bocconi placed 6th in Europe in the QS Global 200 Business School Report 2012, based on the assessments of Recruiters. The MBA program also allowed the School to reach 4th place amongst the top non-US Business Schools in the Forbes ranking, which is mainly based on return on investment. In addition, SDA Bocconi started 2011 by placing first in the world in the Bloomberg Businessweek Ranking for Full-Time MBA Return On Investment and ended the year reaching the 7th position in the Financial Times' Best European Business Rankings, gaining ten positions. SDA Bocconi also ranks 15th in Europe and 42nd worldwide and remains the only Italian Business School in the latest Financial Times Global MBA Rankings, which has seen a general downgrade of European Schools in favor of U.S. Schools. SDA Bocconi, however, ranks 4th in Europe for salary increase three years after graduation, in spite of the negative impact of the financial crisis on MBA graduate salaries: new international and growth-oriented initiatives have been implemented, in line with the School's decision in 2008 to move from a bilingual MBA to an International program entirely taught in English. Further testimony of the quality of the programs offered by SDA Bocconi is the accreditation by the AACSB (The Association to Advance Collegiate Schools of Business), announced on 5 December 2011 by the Board of Directors of AACSB International. 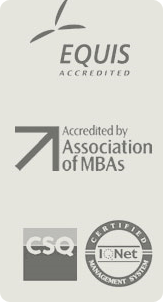 This accreditation, in addition to the previously awarded EQUIS and AMBA, marks the completion of the top three accreditations offered by the most important international institutions, and places the School among just 55 Business Schools worldwide to have received the AACSB accreditation.